These pomegranate sangria gels are like a sophisticated vegan jello shot. Perfect for your fancy adult parties, or a fun Wednesday night. 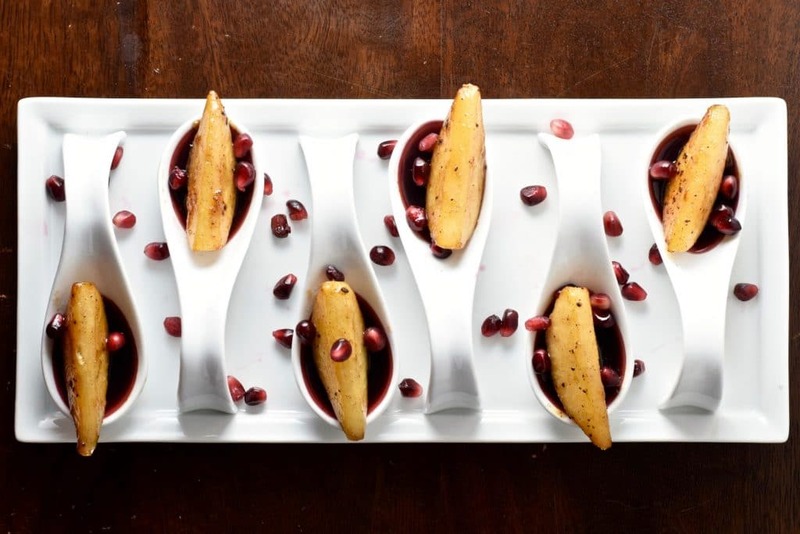 They are topped with brown butter brandy caramelized pears. They are boozy, sweet and tangy, and super fun to eat. I love the depth of flavor that the Maillard reaction brings to the fruit. The soft gels are bursting with flavor, and juicy brandy drenched pears take the sangria gels to the next level. The gels are surprisingly easy to make. The recipe just needs a few ingredients and the only ‘special technique’ required is the straightforward process of setting them with agar. Both alcohol and acidity decrease the gelling strength of agar, but I’ve implemented a simple method with great results. I use two pots so that cold liquid isn’t added to the dissolved agar mixture at any point. In the first pot, add the pomegranate juice, sugar, and agar, then allow time to hydrate the agar before even turning on the heat. Next, you heat the juice mixture over medium-high heat until it comes to a light boil. At this time, in the second pot, heat the alcohol and orange juice to just a simmer. Once the juice mixture has been lightly boiling for a few minutes to fully dissolve the agar, stream in the wine mixture and whisk to evenly disperse everything. At this point you can turn off the heat and test the sangria to make sure it gels to the desired firmness. Take a spoonful of sangria and put in the fridge for 10-15 minutes. If at that point it’s nice and gelled, you can pour the sangria into molds, and the gels will set as they cool. If it hasn’t gelled as desired you can add more agar. The pears are ready in a matter of minutes. Toss the peeled and cut pears in sugar. You can choose organic granulated sugar (yes, it’s vegan), or a dark sugar such as brown or coconut sugar. If you use a darker sugar, you’ll have to watch the pears a bit more closely, and possibly turn the heat down just a smidge. 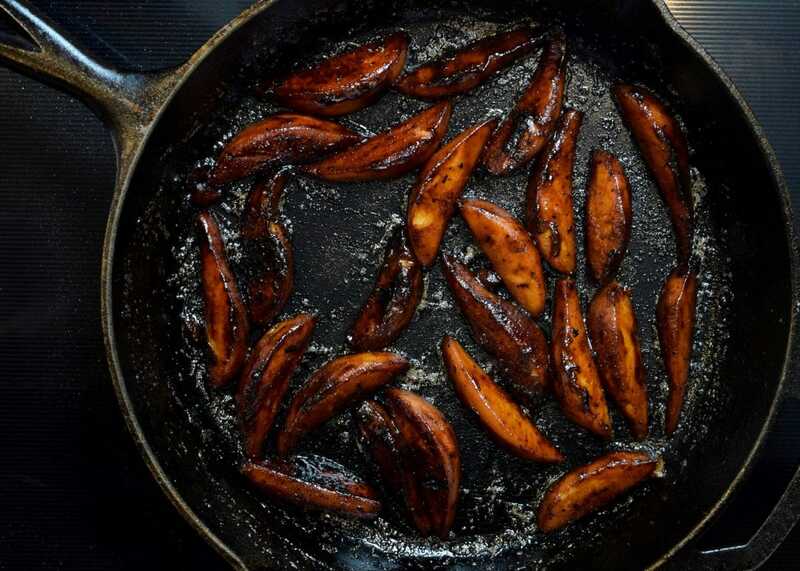 The coconut sugar caramelized pears (shown cooking in the photos) make for a darker, deeper flavored pears, cooked just shy of burnt. But the granulated white sugar gives a beautiful golden color (as seen in the photos with the gels) and has perfect caramel notes. We loved them both ways! The strength of agar can vary by brand, so it’s a good idea to follow the directions to test your gels (see the notes under instructions) and add more agar if necessary. The caramelized pears in the photo with the gels are made with organic granulated sugar, the pears pictured being cooked were made with coconut sugar, and cooked to a deep caramel, which gives them the darker color. Both kinds of sugar work and are tasty, but keep a closer eye if you are using a dark sugar like coconut or brown sugar. Make the gels the morning of, or the evening before, you are ready to serve. Make the pears close to serving. They’ll get less pretty if they sit out or are refrigerated overnight, but will still be delicious! 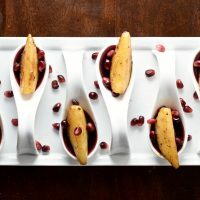 A vegan and sophisticated version of a jello shot, these sangria gels topped with brown butter brandy caramelized pears make a delicious and classy treat for any dinner party. Or for your Wednesday night ;). Put the pomegranate juice, sugar, and agar into a large pot. Cover and leave undisturbed for about 10 minutes to hydrate the agar. Turn on the heat to medium-high and bring the juice agar mixture to a boil, then whisk to make sure the agar is well distributed. Keep the mixture at a low boil, covered, for several minutes to ensure full dissolution. Meanwhile, heat the red wine, brandy, and orange juice in a separate pot. Bring to a simmer, then pour the wine mixture into the juice. Allow to cool fully to room temperature, then place in the fridge and let chill until ready to serve. It will keep for a couple of days in the fridge. Toss pears and sugar together. Heat a non-stick skillet over medium-high heat. 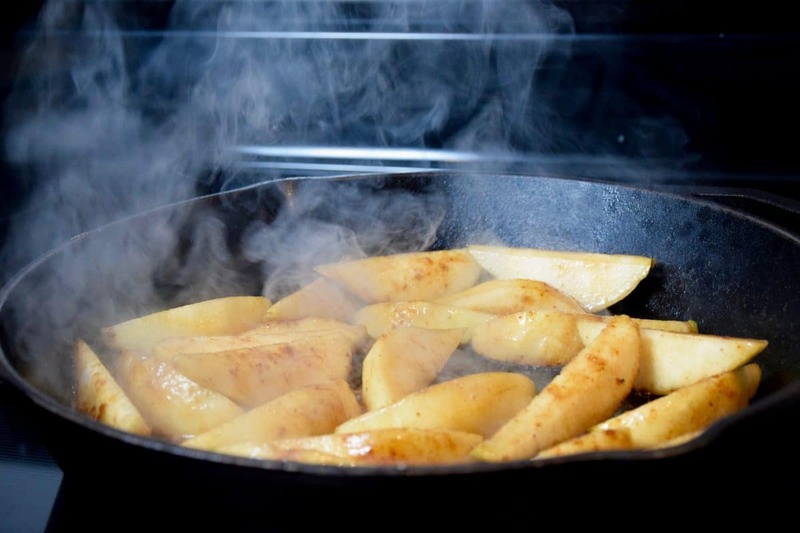 Place vegan butter and pears into hot pan and stir to coat everything in butter and distribute pears evenly over pan. Cook on medium-high heat for about 4 minutes, stirring a couple of times (make sure to turn the pears over so they cook on all sides). Lower heat to medium-low and cook an additional 3 minutes, allowing the pears to soften and turn a golden brown color. Add the brandy, and be careful of any spitting from the hot pan. Let boil and thicken for 1-2 minutes until the pears are nicely coated in the brandy caramel. Remove from heat and they are ready to serve. 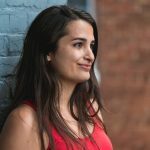 If you set the gels in small, individual sized dishes, place a single slice (or half a slice, depending on the size) of caramelized pear on the gel. If you set the gel in a shallow dish, carefully remove and cut the gel into cubes, and place into a serving bowl. Dice the pears and sprinkle them on top. *You want to use agar powder (not the flakes) here. Flakes are much tricker to dissolve and it will be harder to get consistent results. If you must use flakes, follow the same instructions, but allow more time for hydration in the juice, and boil it for longer so it has more time to dissolve. *You can test the mixture at this point if you'd like, take a small spoonful of the sangria and place it on a plate in the fridge. Leave it in there for 10-15 minutes and then check to see that it set properly (turn off the heat on the pot and just leave it covered while you wait). If it didn't set you can add more agar to the mixture, do this by hydrating some agar (another teaspoon or so) in a little bit of pomegranate juice in the second pot, then bringing it to a boil and allowing it to dissolve before adding it to the rest of the sangria. 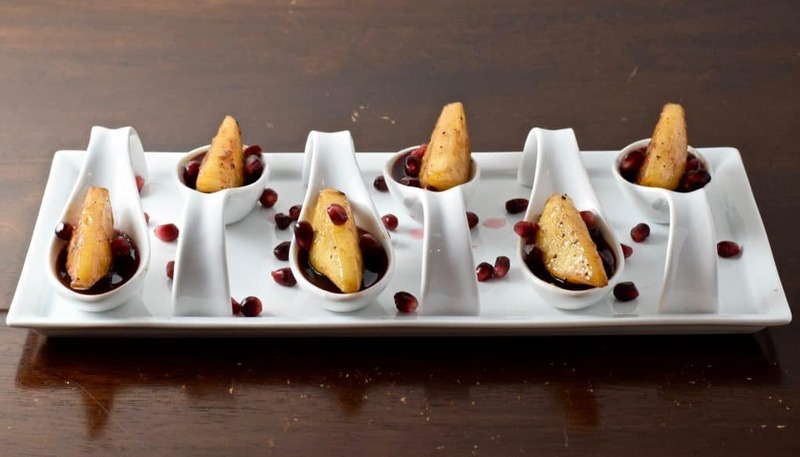 *You can use small dishes such as shot glasses or tasting spoons for molds, or use a shallow dish. If using a shallow mold you can line it with some parchment or plastic wrap to help with removing later.